The St Andrews University Faculty of Divinity wished to create a facility for postgraduate student individual study rooms, student social spaces, some collective facilities of seminar rooms, small CD library and computer facility and four additional staff teaching rooms. 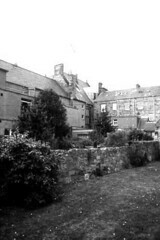 The current accommodation for the students was in various ad-hoc corners of their existing buildings, often overcrowded and two or three to a room. The starting point for the design is the observation that a post- graduate's study of Divinity can often be an individual, indeed solitary affair. The University wished to provide modern, comfortable facilities for attracting students to the faculty whilst at the same time creating the possibilities of social interaction between students so that they could feel part of a wider community. 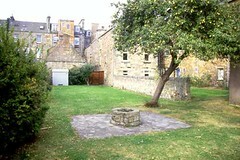 The very clear pattern of the urban grain of St Andrews is the familiar "rigg" system of long backland development separated by narrow alleyways or closes, and this is clear in the immediate vicinity of St Mary's College on South Street, interrupted only by the quadrangle of the college itself. 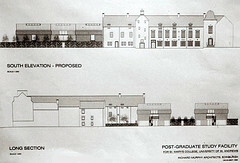 The width of the site for the proposed facility takes up two riggs, each of which have closes which are currently closed to the street. This pattern is the starting point for the design. Three independent buildings are proposed, each with pitched roofs and arranged in a way that they form a natural continuation of the rigg system whilst also forming small gardens or courtyard spaces between them and between the existing buildings. In this way the development would fit naturally into the overall grain of the town but also present themselves as a formal composition to St Mary's College around a small paved courtyard. This is arranged symmetrically around an existing garden gate found in the 16th Century wall separating the former botanical gardens from the St Mary's quadrangle. In such a way the building can satisfy both the informal grain of the rigg of the town and also make a formal statement about a university faculty fronting the quadrangle. 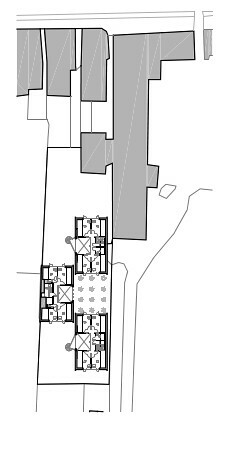 Internally the students' rooms are arranged on first and second floors around the double height communal spaces; ten students per building. At ground floor vaulted spaces contain the remainder of the accommodation and are a link to mediaeval vaulted spaces found elsewhere in the town. 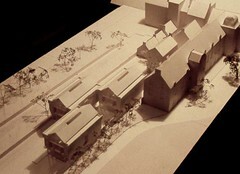 The project currently awaits funding.